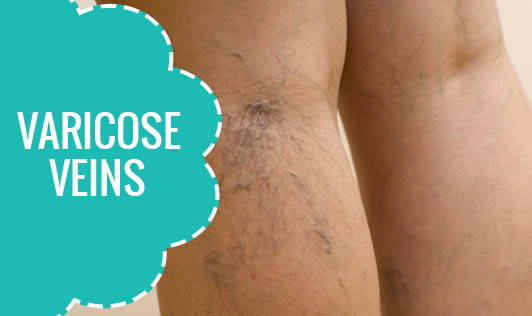 Varicose veins are enlarged veins that are swollen and raised above the surface of the skin. The term commonly refers to the veins on the leg, although varicose veins can occur elsewhere. Varicose veins are commonly found on the backs of the calves or on the inside of the leg. Varicose veins are most common in the superficial veins of the legs, which are subject to high pressure when standing. • Aching, heavy legs (often worse at night and after exercise). • Redness, dryness, and itchiness of areas of skin - termed stasis dermatitis or venous eczema, because of waste products building up in the leg. • Cramps may develop especially when making a sudden move as standing up. • Minor injuries to the area may bleed more than normal and/or take a long time to heal. • Skin ulcers, usually referred to as venous ulcers. • Blood clotting within affected veins. • Acute fat necrosis can occur, especially at the ankle of overweight patients with varicose veins. Females are more frequently affected than males. • Elevating your legs when resting and not crossing them when sitting can help keep varicose veins from getting worse. • Wearing loose clothing and avoiding long periods of standing can also help. If varicose veins are painful or you don't like the way they look, your doctor may recommend procedures to remove them.